Auden's Col Trek is named after John Bicknell Auden, a British Geographical Survey officer, who first discovered it in 1935 and crossed it in 1939. Set at an altitude of 5,490 meters, Auden's Col is one of the high altitude mountain passes in the Indian Himalayan region of Garhwal that connects the Rudragaira and Bhilangana Valley. Auden's Col Trek forms a bridge between the north - west ridge of Gangotri III, which stands at an elevation of 6,580 meters and the ridge coming from Jogin I at 6465 meters on the east. The trek to Auden's Col is one of the toughest treks in the Garhwal Himalayan region and hence it has been least explored. The journey requires acclimatization as it passes through high altitude spots and some of the dangerous moraines, narrow cliffs, stony and snaky paves. The vicinity also includes some of the massive glaciers like the Khatling Glacier, which is at an approximate altitude of 4,200 meters. 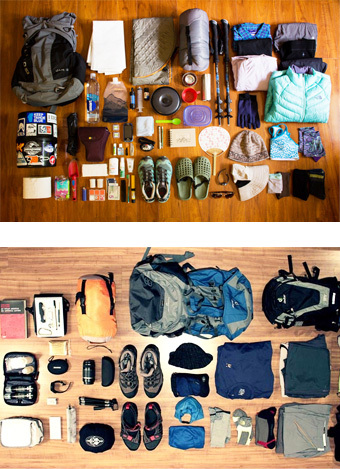 The Auden's Col trek is a dream trek for almost every trekker and mountaineer. The trekking trail cuts and runs through the thick forest of alpine trees; meadows dotted with varied species of flowers; innumerable gushing streams; charming villages secluded from the urban of Garhwal Himalaya; and several temples that reflect the religious significance of the Garhwal region. Although a strenuous trail, the journey is rewarded with the majestic view of the hulking high peaks like the Rudragaira, Jogin group, Bhagirathi group of Peaks and Kedar Dome. The Auden's Col Trek starts from Gangotri at 3,048 meters, which is one of the important Hindu pilgrimage sites and hosts a shrine that is dedicated to Goddess Ganga, the holiest river in India. 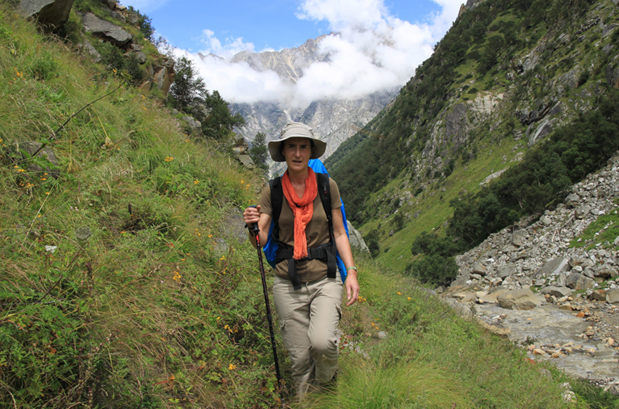 From Gangotri the trail heads upward to Nala Camp, which is 8 kilometers of easy trail. The beautiful walk through a Pine and Birch forest gets transformed into a picturesque walk with views of some of the Himalayan peaks i.e. Jogin and Kedartal range. 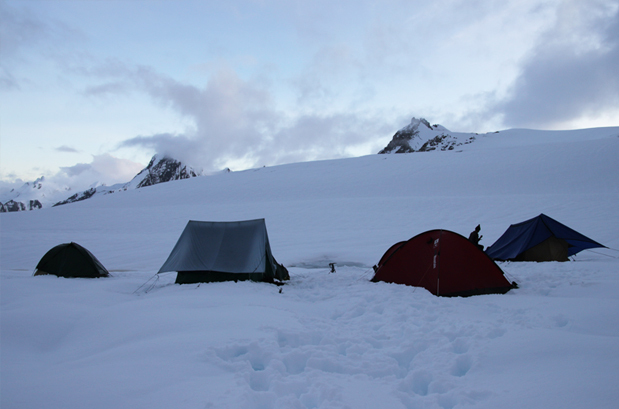 From Nala Camp, the trail continues to Rudragaira Base Camp, which is further 7-8 kilometers gradual climb. Thereafter the route turns to the base of the Gangotri group of peaks and further leads to Auden's Col, passing through the glaciated tracks. From Auden's Col the journey goes ahead to Khatling Glacier and thereafter to Chowki, which is one of the alpine meadows. From Chowki the route heads to Masar Tal and thereafter to Vasuki Tal, the two high altitude lakes in Garhwal Himalayan region. From Vasuki Tal, 8 kilometers of downhill trail leads to Kedarnath, which is another important Hindu pilgrimage site and the remotest site of the Char Dham Yatra. 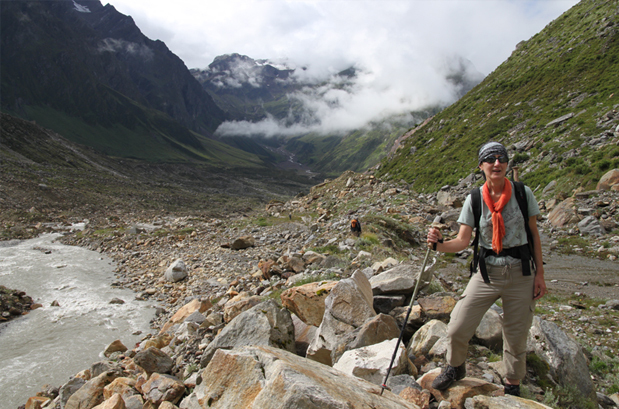 Later the Auden's Col Trekking tour ends at Rishikesh, which can be reached via Gaurikund, Rudraprayag and Devprayag. Auden's Col is a 5490m high mountain pass connecting Rudragaira and Bhilangana Valley. Gangotri - the origin point of River Ganga. 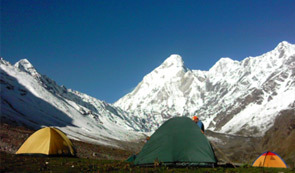 Best time to travel to Auden Col Trek is in summers (May – June) and Post Monsoon (September – mid October). 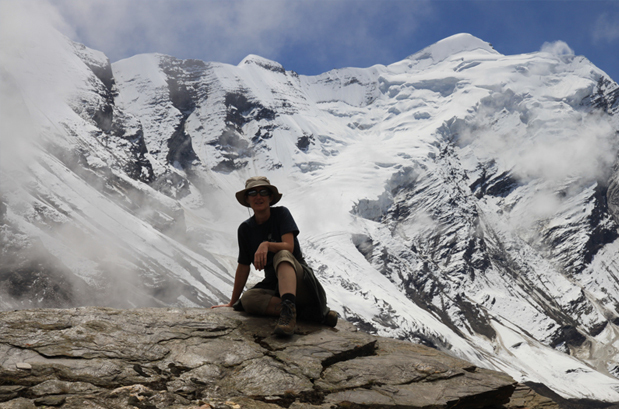 Summers: The weather of Auden Col Trek remains salubrious and pleasing during summers (May – June). The Himalayan range is distinctly visible and the cool breeze adds charm to the vacation. Carrying woolens is advised. 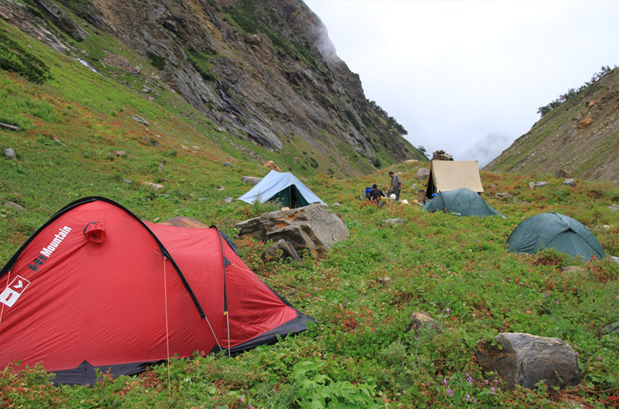 Monsoon: Serenity and solitude are at its best during post monsoon at Auden Col Trek. The region is blessed with heavy snowfall during winters and the accommodation options are also restricted to few. 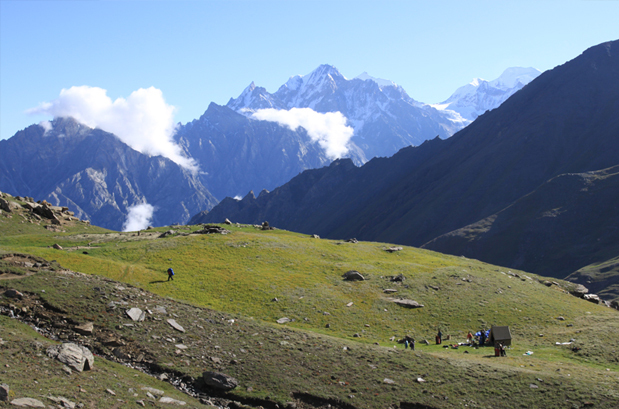 But you can see the best of Auden Col Trek post monsoon as it looks like heaven on earth. Where is the Auden's Col Trek? Auden's Col is a high mountain pass, which is situated in the central Garhwal region. It connects the mountain peaks Jogin I (6465m) and Gangotri III (6580m) and is at an elevation of around 5242m. Auden's Col bridges two glaciers on either side - Khatling glacier on the south and Jogin Glacier on the north. A little distance lower to Jogin Glacier is the Gangotri III glacial system. Auden's Col is approachable from Gangotri and one can trek up to Kedarnath following Auden's Col and Khatling glacier. Auden's Col can be reached via Uttarkashi. There are regular buses from Haridwar to Uttarkashi and shared jeeps are available as well. It takes about 6 - 7 hours to reach. Buses are available early morning, and it is advised that you leave early to reach early to be on the safer side. If you are in a group, you may hire a cab for your group as it will be more convenient and quick. We may help in arranging cabs, the cost of which is to be shared by you on actual basis. In the morning, transfer to Delhi Railway Station and take an AC train for Haridwar at 06:50 hrs. After arriving in Haridwar, our guide will assist you to Rishikesh and help check into your hotel. Evening time is free for leisure activities. Overnight stay at the hotel. After the breakfast, leave for Uttarkashi (1150 m). This 7-8 hours drive will take you through the course of narrow streams of Ganga Valley and later along the Bhagirathi river valley. Upon arrival, check in to the hotel. Take rest for a while and then head out for exploring the major attractions of Uttarkashi. Overnight stay at hotel in Uttarkashi. Post breakfast proceed to Gangotri. The route passes through Harsil, home to the famous 'Wilson Apple' followed by Bhairon Ghati, the course of the Bhairav Ganga River upon which a steel girder bridge overlook a mesmerizing deep gorge. The drive takes around 4-5 hours to reach Gangotri. Upon arrival check-into the hotel. Overnight stay in hotel. After breakfast, you will be taken out for exploring the holy town of Gangotri. Visit the Pandav Caves, which will remind you the memories of great Indian epic, Mahabharata. Spend first half of the day exploring this part of the town. Post lunch, set out for exploring the famous Ashramas, which best reflect the Hindu culture and practices. Spend the evening witnessing the Aarti of River Ganga. Dinner and overnight stay in the hotel. The walking trail starts from the left of the valley and ascends to the Nala Camp. Initially, the trail passes through Pine and Birch forest and soon reaches to the picturesque spots from where one can have a glimpse of Jogin and Kedartal range. Overnight stay in tents by Rudragaira River. After the breakfast, trek to a ridge followed by a side stream. 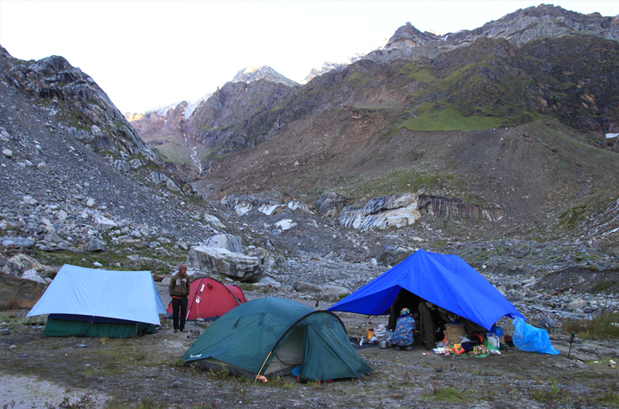 Upon arrival at the Rudragaira base camp, relax in the tents. As the weather and environment here is certainly different, it is better to rest and acclimatize for a day. 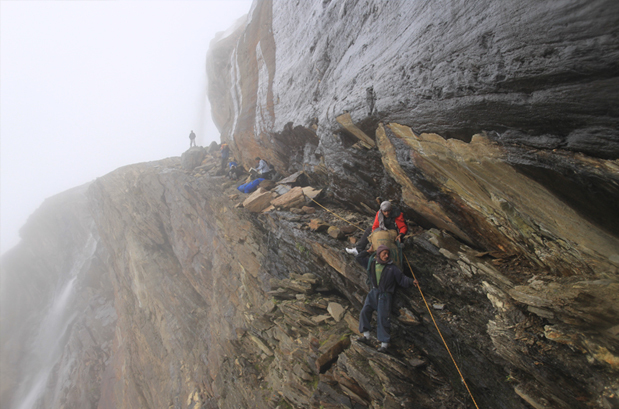 If one is not feeling exhausted he/she can get engaged in hiking on the route that leads to the Rudragaira Peak. Spend the night in tent. 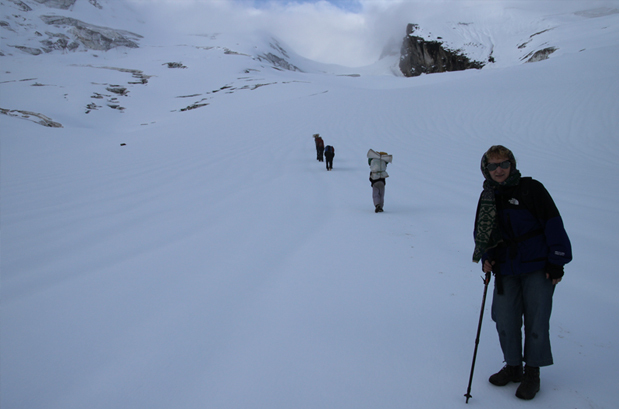 The trek in this part gradually gets tougher and at times it becomes challenging. While reaching the camp, one can witness a glimpse of stunning views of Gangotri I, II & III peaks. Overnight Stay in tent. The trek for the day is quite challenging and one need to maintain a strong energy level. The route to the Auden Col base camp is full of moraine. Overnight stay in tent. An early start is a requirement for the trek today. 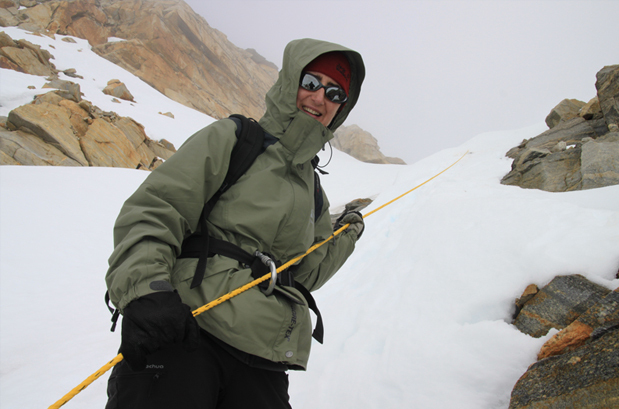 The walk involves technical aspects on the glacier which continues until one reaches the pass. To cross only around 5 km distance to the pass it may take 4-5 hours. 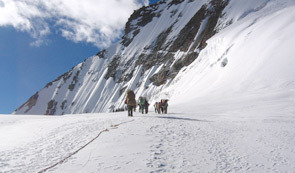 To cross the pass, a rope is fixed on either side. Once the tent is set, take rest and have some healthy food to get energy for another grueling day. Overnight stay in tent. 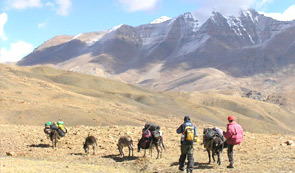 The trek today is a technical one, thus technical gears will be supplied for trekking in this part. Passing the glacial stretch, the path leads to the moraine, from where the trail descends to the riverside camp. Overnight stay in tents. After a trek of around 3 km by the river-side, reach an open meadow. Another 4 km trek will lead you to Chowki, a grassy and comfortable spot, ideal for camping. Overnight stay in the tents. This day's trek is a switchback journey that leads to a ridge set in a picturesque valley. The trail is well defined with wonderful natural surroundings. Further the trail leads to Masar Tal. Upon reaching, transfer to the camp that is set near the mesmerising lake. Overnight in the tent. The trek for the day involves 3kms climb to reach the ridge. The road further leads with switchbacks and finally leads to the picturesque lake, Vasukital. Night stay in tents pitched near the lake. 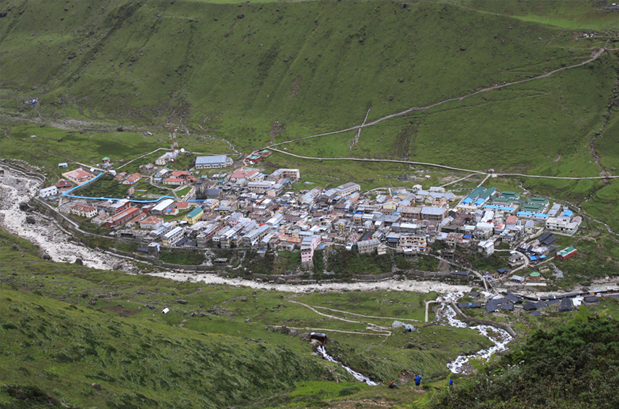 Today, trek towards one of the sacred most pilgrimage centres in India, Kedarnath. To descent only 5 km, it may take around 3 hours. Upon arrival, pay a visit to Kedarnath Temple. Overnight in the hotel at Kedarnath. Wake up early in the morning as you will be trekking towards a well laid 6ft wide towards Gaurikund (14kms). Head to the village of Rambara where makeshift restaurants serve food to the pilgrims. Descending further you will reach Gaurikund. Board our pre-booked vehicle to reach Rudraprayag, which will take around 4 hours drive. Rudraprayag is another well known religious destination located where the river Mandakini and Alaknanda confluence. Overnight stay in hotel at Rudraprayag. After having breakfast, drive to Rishikesh. The route passes through another confluence, Devprayag where River Alakananda and Bhagirathi embrace each other. Upon arrival at Rishikesh, check-in to hotel and later go out for exploring the magnificent elements of the city. Spend the evening visiting the ashrams and temples in Rishikesh. Do not miss to witness the Ganga aarti in the evening on the Triveni Ghat. Dinner and overnight stay in hotel. Wake up early morning and after breakfast drive towards Delhi. When to book Auden Col Trek? You should book Auden Col Trek well in advance (at least 4 month prior), so that you get ample amount of time to prepare for the trek. Our pick up and drop point for Chopta Chandrashila Trek is New Delhi Railway Station at platform no. 16. We will hand over the train tickets and you can board train from there to Haridwar. At Haridwar, our guide will pick you from the railway station and then will assist you further. 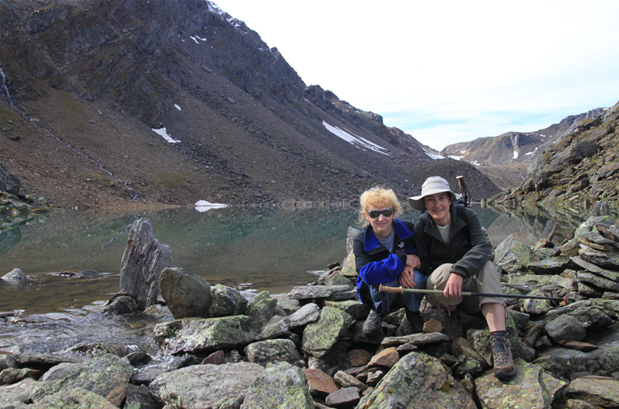 What is minimum age required for for Auden Col trek? Auden Col Trek is a challenging trek with a maximum altitude of 18000ft (5490m), so the minimum age required is 18 years. What will be the minimum temperature during Auden Col Trek? 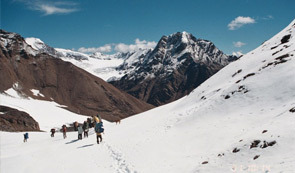 In the month of May & June the temperature during the trek can go as low as 2 Degree Celsius during the night and in between September – Mid October the temperature can drop to minus by night. How long we trek during Auden Col Trek? 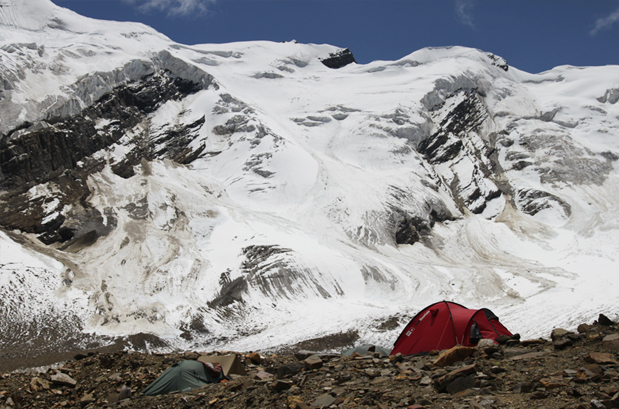 We plan our treks in such a way that after 6-8 hours of trekking we reach next camp in between 2 – 3PM and normally one has to trek 10-15 Kms a day.